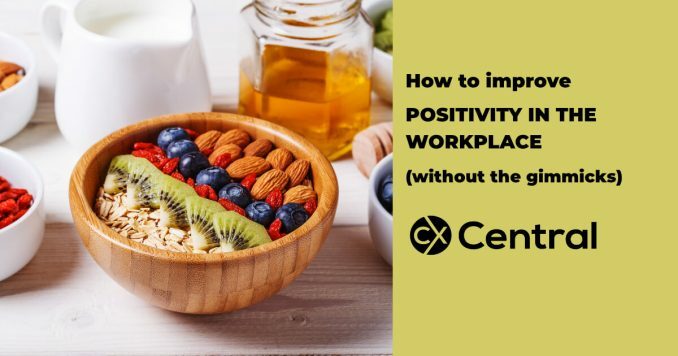 We all know workplace positivity is a vital aspect of running a company and will reduce your employee turnover. Yet we think that paying for gimmicks like a bowling night or painting a wall in bright colours will suddenly make everything wonderful. Fruit won’t overcome intimidation, uncertainty or a constant glass half empty attitude. The only long-lasting and cost-effective strategy to increase workplace positivity is to work on each and every individual. To teach them how to decrease and resist their own negative tendencies  only then will you achieve lasting change. Too often we let negative people choose our attitude for us. Why give someone else the power to determine how you think, feel and act? It is stupid when you think of it like that. Next time you start to get frustrated or angry… stop…breathe and ask, ‘is this the way I want to feel?’ By choosing your response you can then choose how long to stay in that emotion, and who gets to see that emotion. Not every colleague needs to see your anger, only those who deserve it. It stops you from letting an incident early in your day ruin yours and everyone’s whole day. Aside from learning to choose our attitude, we must learn how our attitude and behaviour affects other people. Too many businesses either forget or are scared to celebrate success. Often this is because the boss thinks people will then slacken off or rest on their laurels. This is garbage and often the excuse of lazy bosses masquerading as busy bosses. When was the last time you genuinely celebrated an achievement that wasn’t a birthday? It doesn’t have to cost a fortune as sometimes simply calling everyone together and saying ‘well done, great job’ is enough. If you need some ideas here are 25 tips to reward staff that won’t blow the budget. Simple things like saying thanks, hello, well done or are you ok can make a huge difference. In your next meeting, take time to sit back and listen to the language used, including the tone of the words. Are they appropriate to the situation, are they unnecessarily aggressive? Are people who might have something to say remaining quiet? Think of all the good ideas and creativity you aren’t hearing because of this. You need to assess the problems, then determine standards such as what type of language/tone you will or won’t tolerate anymore. Instead of constantly highlighting the negatives, it is important to learn to see the positives that occur every day. There is a process that teaches you to retrain your brain and make noticing the positives far easier. Youd be surprised how many there are when you begin to notice. Retraining your brain can turn what you think is a bad day into a not so bad day or even a pretty good day. Now you dont have to be best buddies with everyone you work with, however understanding a bit more about who they are and what they do can increase empathy and tolerance. When this occurs you lose a lot of the petty infighting and rumours that run riot, creating unnecessary workplace tension. Redesigning your meetings and what you talk about in them is often the best place to start. The mantra of for things to change, first I must change has to be adopted by every member of your staff, especially your leaders.